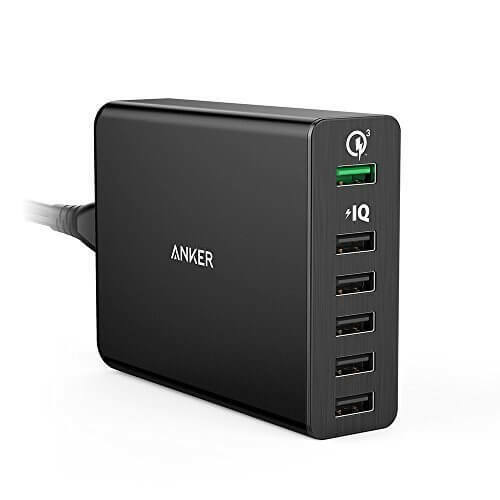 Today’s Deal over at Amazon is on the Anker 6-Port USB desk charger. Right now it is on sale for $29.99, a savings of 60% off the regular price. For that, you get a desktop charger that provides one Quick Charge 3.0 compatible port and five standard ports that supports Anker’s PowerIQ technology. That tech assures you get the fastest – and safest – charge for your devices. Each port is able to pump out 2.4 amps of energy to give you maximum charging power. It total, it has 60W of power. While powerful, the Anker charger is designed to be portable. It just under 5″ in size so if you need to move it from a desk to another place in your home or office, you can do so without having a big hassle or it being an eyesore. it. That means the entire family can charge up their phones and tablets from one place. As always, Anker provides an 18-month warranty on this charging hub so you can be confident in the purchase. For those of you who are Amazon Prime customers, Today’s Deal ships for free to you. For more details, head over to Amazon.